The purpose of my Woodworking in America session on inlay, “Understanding Inlay: A Key Piece in Connoisseurship & Identification” wasn’t to provide rules of thumb to discover the orientation of antique furniture – the idea was to give a few general guidelines that would help identify from where a particular antique piece of furniture may have been built. 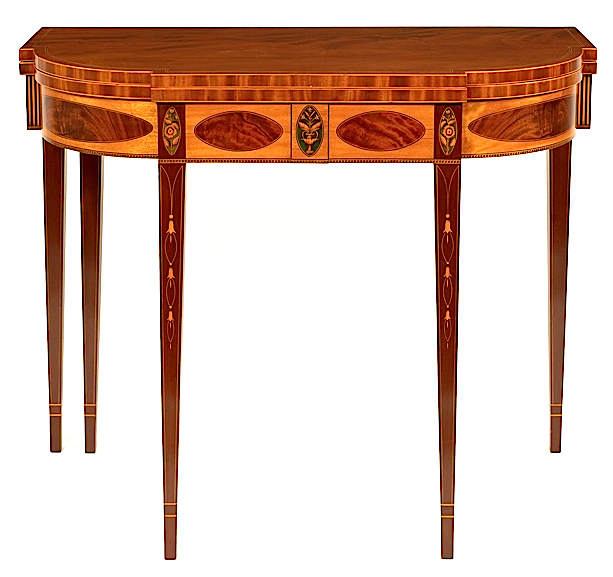 We focused on card tables from the Federal period due to the fact that each major city built card tables from the simplest designs to the most intricate, heavily-inlaid tables. I emphasized throughout the class that the information presented should be grouped with other gathered information so one could draw a conclusion. That stated again, I’ll pass along a few of my comments. The first and easiest way to identify a card tables point of origin has nothing to do with the inlay, although you could also establish the same origin if you studied the banding and pictorial inlays on the table. Here, however, construction techniques are a dead give-away. The table pictured above is from New York. We know this because of the fifth leg. In almost all cases, if you have a fifth leg, you are looking at a card table built in New York. Let’s get back to inlay. The most fascinating of inlay banding, at least to me, is what is known as lunette inlay. 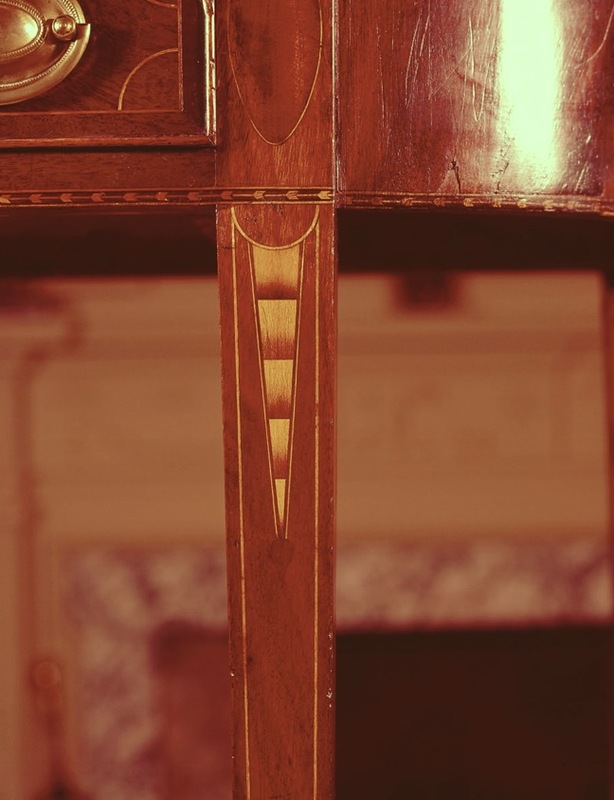 There was a time in our furniture study that whenever this inlay was found on a piece of period furniture, that piece was immediately associated with the father and son team of John and Thomas Seymour. Later, a similar inlay was found on other signed furniture not built by the Seymours. That caused dealers and collectors to question the attribution of the Seymour work. 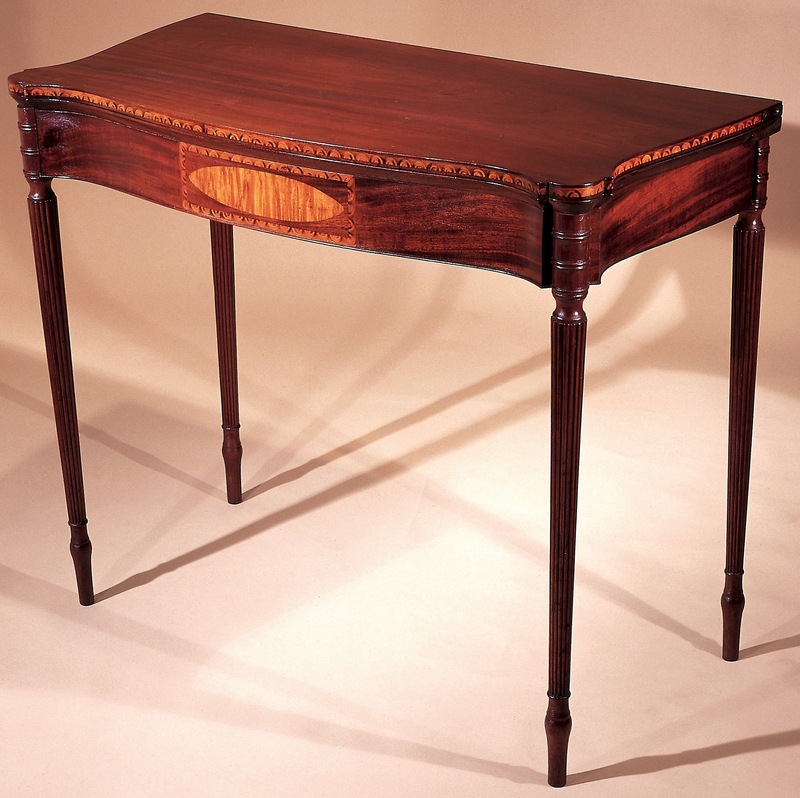 The table shown above is a signed piece built in New Hampshire, and not a card table built by a Seymour. As a woodworker, I wonder how this inlay was made in the period. (The left-hand photo is a close-up look at lunette inlay.) Was it laid up in a pack then sliced as was other inlay? Some woodworker think so. Or was it laid up a stick at a time? There is a camp of today’s woodworkers who think that was how it was done in the late 1700s. Regardless of how you may think it was made, it is a great piece of work and worthy of the amount of study it has received. Another area that I find interesting is to look at the use of eagles in pictorial inlay. 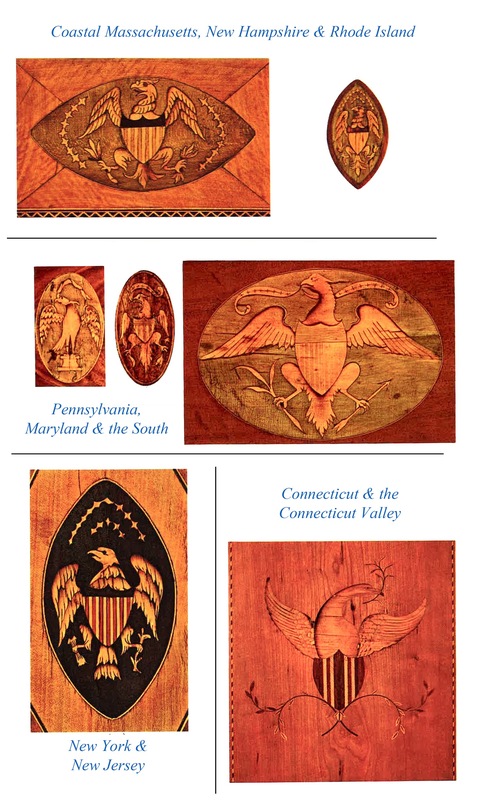 The image at the right is a grouping of eagle patera I pulled together from “American Furniture The Federal Period” by Charles F. Montgomery. (I highly recommend this Winterthur book if you are at all interested in inlay.) If you study the eagles, you’ll notice a few interesting things. First of all, Connecticut inlay – not just the eagles, but most of the inlay work found in this area – is very artistic and quite different from work found elsewhere. Pinpointing period work from the Connecticut River Valley and from Connecticut is rather simple. Of the remaining eagles, take a close look at the inlay from New York. Notice how lifelike the eagle appears. This eagle looks bold, strong and very patriotic. The Federal period in which we’re looking is right after the Revolutionary war when New York was the nation’s capital, until 1791 when it was moved to Philadelphia before moving to Washington DC. Patriotism had to be extremely strong at the time. Was this strength reflected in the inlay produced at the time? One last thought on eagle inlay: If you study the eagles shown in Pennsylvania, Maryland and the South, you’ll see that each of the eagles have something in the mouth, a streaming banner. This could be a telltale of furniture from these areas. 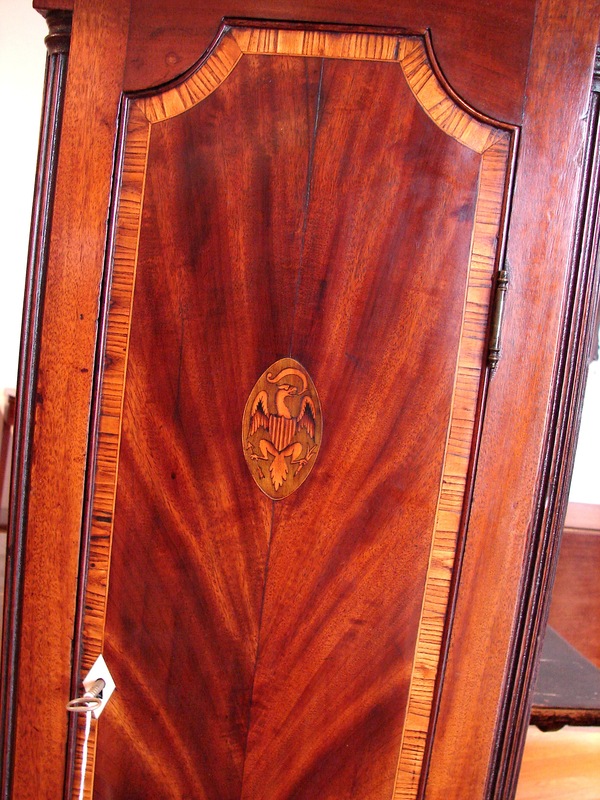 Shown at the right is a door from an antique clock. The clock is known to be from Pennsylvania. And the eagle has the banner held in its mouth. This is just a taste of the what can be discovered when studying inlay. Over the next couple of months, I’ll present another post on what I’ve discovered about inlay. If you have some interesting information to share, please do so in the comment section below. I’m pulling together the information for one of my presentations at the 2013 edition of Woodworking in America. On Sunday, I’ll talk on the use of inlay to help identify from what regions Federal-period furniture was built. Also in this class, I’ll demonstrate how a few pieces of banding are constructed. Near the end of the class, out come the hot plates, iron skillets and sand because each person in the class – at least those willing to give it a shot – will shade and assemble a sand-shaded fan. It’s not too late to register for the conference, or to pick up a one-day pass, if you’re in the area. During the period, string inlay – generally categorized as light and dark (no species given) – was found in all regions. So how do you differentiate between Massachusetts and Maryland? The answer is simple; you evaluate how the stringing was used. Another area where you begin to see differences between regions is as you study banding. And of course, pictorial inlay also helps identify regions. One of the best ways to study and learn how stringing, banding and inlay can tell the story of where a piece was originally built is to study card tables. 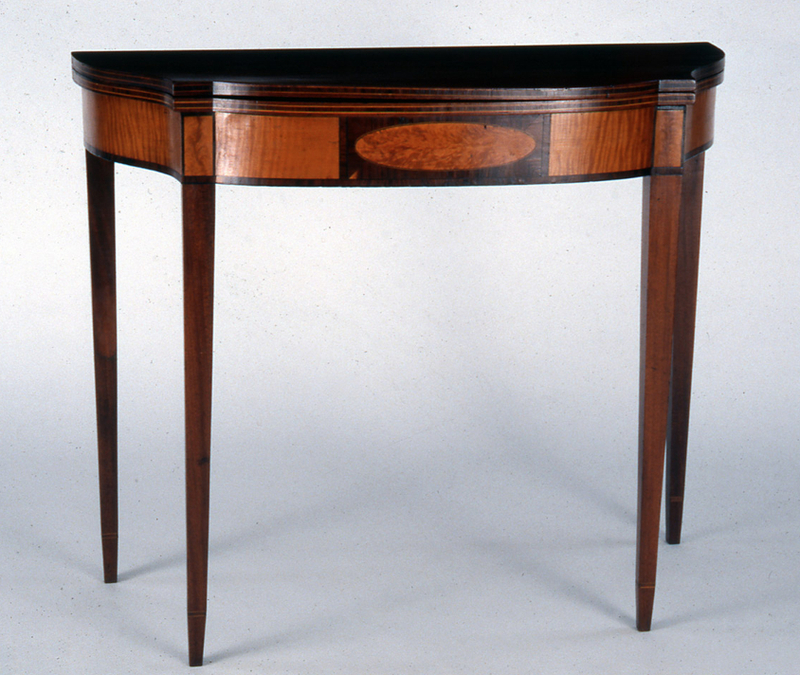 When these tables were built, the choices furnituremakers had available were limited to what they produced in the shop, but more often than not, they chose from what specialist had to sell – each region had its own banding and pictorial inlays. You should, however, be warned that you have to study antique or period card tables and not reproduced tables unless the maker was careful in his or her selection of material. Today, we can have inlay shipped from all over the country, so it would be difficult to nail down where the pieces were built based upon the decoration. 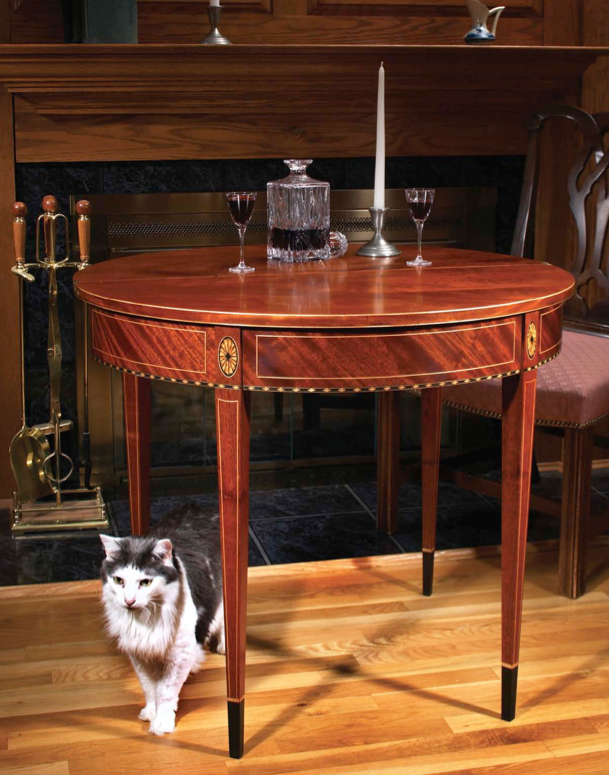 In the opening photo, for example, I reproduced a Baltimore card table and while I added the light string around the top’s edges, which is very characteristic of tables from Maryland and Baltimore, I didn’t pay particular attention to the diamond banding at the lower edge of the apron, or to the oval inlays at the top of each leg. In the second photo, you also see light stringing used on the top. In this example, though, you’ll notice that the stringing is not at the edges of the top, but set a bit off the edges. A simple call to make – and please keep in mind that these rules are not always adhered to – is that this card table was not built in the Maryland or Baltimore area. In fact, this table is from Massachusetts. You need to look at other features to make that call. The legs on card tables also provide a good indication as to where a table was built. Patterns and designs of bellflowers are distinct from region to region, as are the added inlay at the top of the legs. 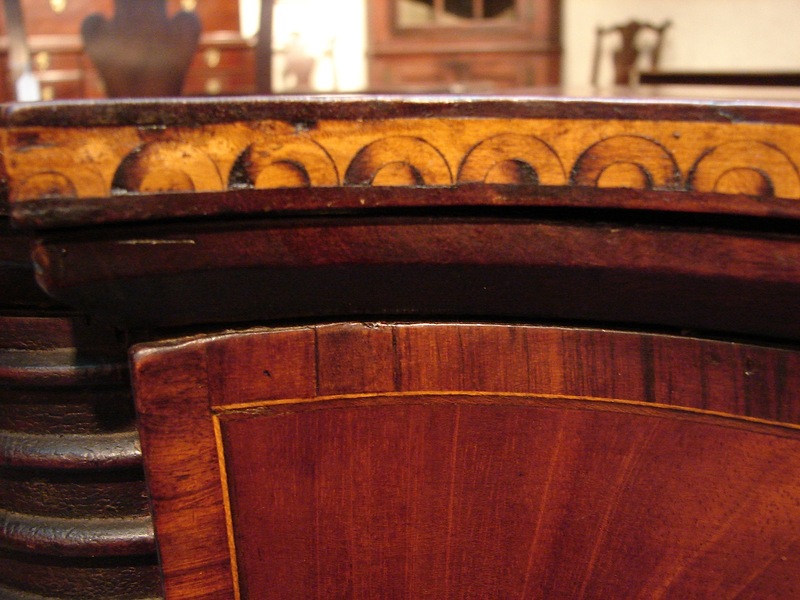 On the leg shown at the left, the icicle drop (segmented triangles of shaded light-colored inlay) is a good indication that the table was originally built in Connecticut, as that design is often found in the area. Conversely, the photo at the right is more often found on tables from New York, especially if you study the design of the bellflower drops. The intersecting ovals that surround the bellflowers are found on other pieces from the same region. And while it’s possible to identify the origin of card tables and other furniture through the study of inlay, it’s always best to use additional information before making the call. If, for example, I showed you a picture of this last table, and you could see that there were five legs – the extra being the swing leg that supports the opened table top – you would be better informed and could more easily place this table in the New York area. It should be a fun class. I hope you can make it.